Spring is one of my favorite times of the year in Maine. The warmth of the sun on my face, the flowers coming up from the ground to share their beauty, the leaves unfolding in a brilliant display of green, and the inner sense of being able to breath again. It’s not that I don’t enjoy being being outdoors in winter, but I crave outside time in the spring. 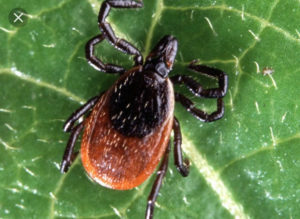 Unfortunately, some of this wonderful “Spring back to life” includes the resurgence of the deer tick population, and the challenge of enjoying the outdoors without becoming a meal for these local nuisances, along with the unfriendly bacteria that they carry – namely the bacteria that causes Lyme Disease, (along with a growing number of other “co-infectious” diseases as well). Lyme Disease has become a common household word in our country and is the most common “vector-borne”, (transmitted by a secondary method, such as a Tick/mosquito etc), infectious disease in North America, Northern Europe, and Asia. Many estimates now state that the likely number of new Lyme Disease cases is over three hundred thousand a year, and our very own state of Maine has the highest Lyme Disease rates per capita, in the nation. These high rates of exposure are further compounded by the fact that Lyme Disease is also a very complex infection, both to understand and to treat. The problem is that it can, and so often does present as something other than Lyme, (including; multiple sclerosis, fibromyalgia, heart disease, nervous system disorders, psychiatric disorders, chronic fatigue syndrome, lupus, rheumatoid arthritis, Crohn’s disease, polymyalgia rheumatica, thyroid disease, or several other autoimmune diseases). It does this so successfully that it has become known as the new “Great Imitator”, of other diseases. (The previous “great imitator” was Syphilis, which oddly enough is also a bacterial infection that has a very similar structure to Lyme; they are both Spirochetes). Since Lyme can act like so many other bacterial/viral/autoimmune diseases, it is hard to diagnose and unfortunately if not diagnosed and treated early, it can go on to cause: heart and blood vessel complications, nerve damage, joint damage, and other systemic problems within both the endocrine and central nervous systems. This wide spread systemic effect can do real damage throughout our body, and often creates havoc in the lives of those who are struggling with Lyme Disease. In fact, this effect has been described by Lyme experts as a Multi-systemic infectious disease syndrome, (MSIDS), and I personally believe that this is a useful way to look at Lyme. Here’s why: “Multi-Systemic”, simply means that it will effect numerous areas in our body, and reminds us that each person will be effected differently, thus Lyme really needs to be seen as an individual disease. Therefore, we need to understand and treat Lyme Disease with an approach that reflects an awareness of it’s “systemic impact”, and that accounts for the individual ways in which Lyme may effect each one of us. We can not assume that there is one best and only approach to treatment. Knowing this, it becomes evident that there needs to be a supportive and multi-disciplinary approach if we are find real, effective and sustainable treatments. Thankfully we live in Maine, and even though we have the highest rates per capita of Lyme Disease in the country, we are also blessed to live in a community where there are a great many “Lyme Aware” providers who are using a number of unique and different therapies to bring healing to those who suffer from this disease. Additionally, it has been my experience that these providers also bring a true attitude of collaboration and a sincere desire to work together for the best interest of the patient. When this collaborative attitude and integrative approach is used for Lyme, it allows for some fantastic results. This attitude of integrative collaboration is what drives the approach at our clinic, “DaySpring Integrative Wellness”, and is reflected in both our treatment recommendations, and the counsel we give to our patients. – Remember to do, “Tick checks”, immediately after you are exposed to areas where you might have come into contact with ticks. Get them off quickly, (The CDC states that a tick must be on for 24-48 hours to infect you, however I have personally seen cases where someone tested positive for acute Lyme when the tick had only been attached for less than four hours). – Find a healthy and natural tick/insect repellant, like Cedarcide Tickshield (cedarcide.com/ts), the natural cedar defense that is recommended by Mary Penner, NP, (One of our local “Lyme Experts”, and the Founder of Therapia in Brunswick). – If you find a tick that is embedded, get a device that will effectively pull the entire tick off intact, (like the “ticked off” scoop for instance). Then keep the tick intact, contained in clear tape so that it can be inspected/identified, and if needed sent to a lab for testing to confirm if the tick is a carrier. – Contact a “Lyme Aware” provider as soon as you find a tick that has been embedded to discuss the signs and symptoms to be aware of that might indicate that you have been infected with Lyme Disease. – At DaySpring Integrative Wellness, we promote and teach “The Eight Natural Laws of Health”, which are essential in building and maintaining your immune system – “The Key” to maintaining health, and successfully overcoming any illness/disease. – Seek out ways to work in harmony with the natural design that your body has to fight diseases such as Lyme. For instance, instead of trying to work against the body’s natural fever mechanism, at our clinic we augment this powerful disease fighting response by using, “Whole Body Hyperthermia” treatments that elevate the core body temperature to a level that has been shown to effectively kill Lyme bacteria. Remember that the body is designed well, and we should be partnering with this design. – Hydrotherapy, (which has been shown to dramatically reduce and in some cases eliminate the the bacteria from the body. It is also a powerful stimulator of the immune system). – And other new or old modalities that may prove useful. #4: Finally, remember to seek out physical, mental, emotional, and spiritual support for yourself. Find a Lyme support group (www.mldse.org), encouraging friends, family, spiritual connections, faith groups, and a team of Lyme knowledgeable practitioners to assist you in carrying the burden of Lyme Disease while working on a long term solution. Most of all don’t let Lyme steal your joy – because regardless of the season, life is a gift that is meant to be enjoyed.